Preheat oven to 400 degrees. Spray a 13×9 pan with Pam. Wash potatoes, and dice up into medium-sized pieces. Combine one portion of the spices, oil and butter. Pour over potatoes, and toss. Place potatoes into pan and bake for 15 minutes. Meanwhile, combine another portion of the spices, oil and butter. Pour over green beans and toss. Set aside. 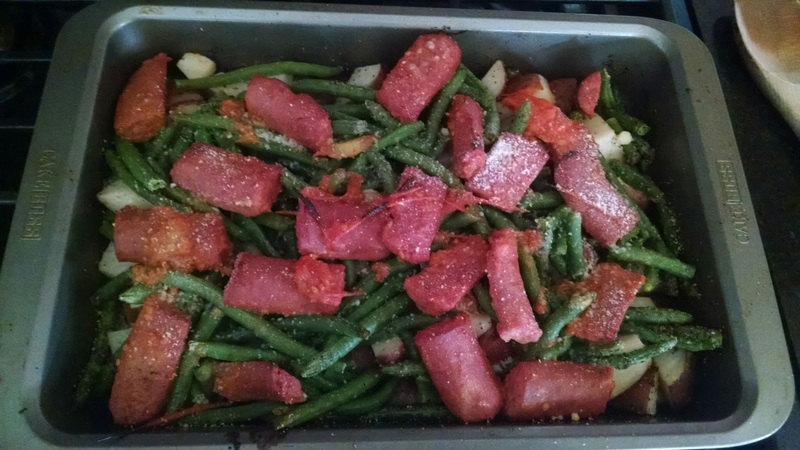 Slice up the kielbasa and tomato. Melt butter and garlic in a pan. Sautee the tomato and sausage until the sausage is slightly browned and the tomato has turned to sauce. When the potatoes come out of the oven, stir them. Pour the green beans evenly over the potatoes. Lay the tomato and sausage mixture over the green beans. Sprinkle Parmesan cheese over the food, and broil for 3-5 minutes.